Chas Dash is an executive for Midwestern Accident and Life. The insurance company's premier hatchet man, he denies claims with ruthless expedience to ensure the continuation of the beyond-his-means lifestyle he is addicted to. He's living a latter-day American dream of McMansions, in-ground pools, Cadillac's, leather furniture, chrome appliances, and credit to pay for it all. What he wants, he buys and pays for later until 20 years of spending and refinancing caches up with him. Faced with the possibility of losing it all, Chas does the only thing he can do... go on an arson and murder spree. 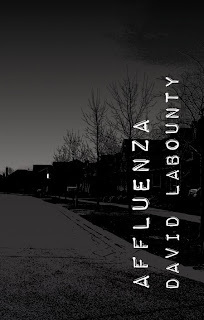 With Affluenza, David LaBounty continues his examination of the darker aspects of American society. Previously tackling complacency and collaboration in the face of an overwhelming government (The Perfect Revolution, Silverthought press, 2006), LaBounty this time turns his pen to conspicuous consumption and usury and the role of business in promoting both. That he does it without sounding sanctimonious is the real treat of this novel. Given the recent economic meltdown, it would have been easy to lay the blame for Chas's woes at the feet of the financial sector, and while LaBounty acknowledges their culpability in creating the conditions, Chas is never portrayed as their victim, but as a knowledgeable, and willing, participant in the cycle of spend and borrow, even if he doesn't see it himself. Even the title hints at the authors thoughts on the subject. 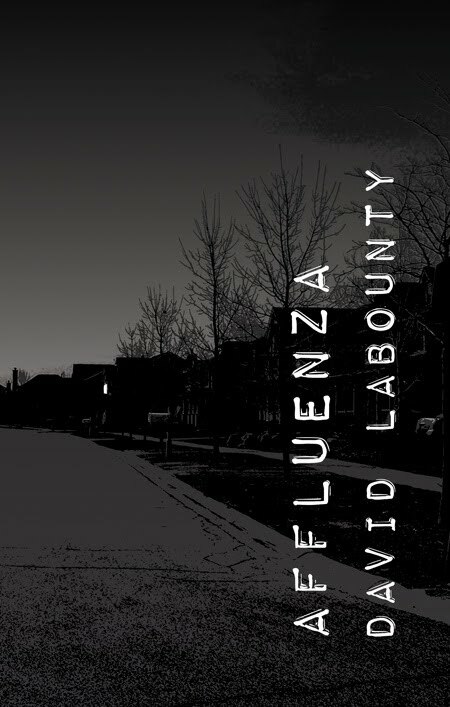 Affluence and Influenza conjoined. Virulent affluence. The need to responsibly care for ones family takes a back seat to the desire to keep up with the neighbors, to project just the right image to friends, to be the envy of co-workers, all of whom are doing the exact same thing. The wheels on the bus go round and round. In Affluenza, Chas Dash is the poster child of these failings. When Chas embarks on his murder spree, LaBounty chooses the perfect implement for his protagonist's destructive urges: fire. The victims, chosen by Chas because they owe more than they are worth, are skewed reflections of himself, dead inside, narcissistic, materialistic. Ironically, the consumers are consumed. The pages turn fast in this story (I read it in about ten hours) due in part to LaBounty's bare bones prose and his narrow focus on the first person narrative.